If you sit 10 feet away from a 36-inch regular TV, Weber explains, you can't tell the difference between a normal picture and the high-definition standard toward which the TV industry is moving. You could widen the cathode ray tube—the venerable device that gave TV its nickname "The Tube"—to the 60 or more inches required to see a one-millimeter pixel at 10 feet. But the tube can't get wider without getting deeper, so you would have to knock out a door and use a forklift to get a big one into your living room. Projection systems have spatial limitations of their own caused by the placement of the projector and screen, and they require a dark room for good results. Liquid crystal displays have the advantage of thinness (that's why they are great for laptops), but they are not as bright as plasma displays, they can't yet be made as wide, and their pictures disappear when viewed from the side. That's why Japanese companies like Matsushita and Fujitsu are finally in a position to see the payoff for their long commitment to plasma display panels. Weber does see the possibility of future U.S.-based manufacturing of plasma displays. But the companies will be Japanese, looking to move production closer to the growing U.S. market for their products. Johnson is more optimistic about U.S. leadership in the further development of plasma displays. Now retired from SAIC, he has gone back to running his old consulting company, which is incorporated in Illinois. Johnson believes Illinois can have "a second round at the plate, and maybe hit the ball again." He is interested in partnering with current ECE faculty and students who are conducting research relevant to plasma displays. For example, Professor Kevin Kim's lab is perfecting "microspheres" that may be useful for evenly depositing materials in plasma display manufacturing. Phil Krein developed an energy-saving power supply for plasma displays. And Mark Kushner developed software for simulating the physical dynamics of plasma cells. Johnson would also like to organize a seminar series on flat-panel displays at U of I. "The press kept telling me that I was wrong, that it was going to be the future television," recalled Bitzer. "But that was not my heart. My heart was the education." Bitzer must now concede that the press was right, but he can still point to Weber's 60-inch wonder with all the pride of a new grandfather: "Did you ever see a display like that? Isn't that beautiful?" 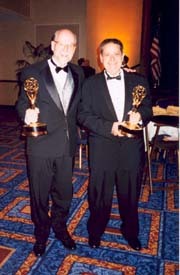 Bitzer (right) and his old student Robert Willson were reunited at the Emmy scientific and technological awards dinner in New York City on October 2, 2002. Bitzer retired from the ECE faculty in 1989 and is now on the computer science faculty at North Carolina State University. Willson is a systems engineer at Analex Corporation and a part-time minister. 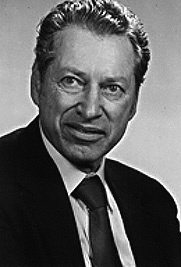 H. Gene Slottow, 1921-1986. ECE head Richard Blahut and Professor Tim Trick accepted Slottow's Emmy in New York and then presented it to Slottow's widow, Irene, at a ceremony in Urbana. Mrs. Slottow has donated the Emmy to the ECE department.